WASHINGTON (CNN) -- Before lighting up that patriotic sparkler this weekend, remember to play it safe. 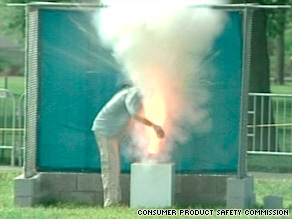 The Consumer Product Safety Commission uses mannequins to show the dangers of fireworks. That was the message from the Consumer Product Safety Commission Tuesday, which put out an early July Fourth holiday warning urging families to put safety first when celebrating with fireworks. "We know that 70 percent of all [fireworks-related] accidents occur between June 20 and July 20," commission head Inez Tenenbaum said during a demonstration of fireworks safety on the National Mall. "This is the time of year that people are using fireworks." According to the latest report from the CPSC, there were seven fireworks-related deaths and roughly 7,000 reported injuries in 2008. "Never pick up a firework that is a dud [and] hasn't fired, because it might go off in your hand," she added. After Tenenbaum spoke, government lab technicians demonstrated some of the potentially deadly consequences that can result from a failure to observe basic firework safety. Using mannequins posed in typical outdoor settings, the technicians showed how a simple sparkler often used by children can easily cause clothing to catch fire. They also demonstrated the explosive power of cherry bombs, among other things, using them to blow up large watermelons. In another setting, they showed how professional-grade and illegal fireworks often use faster-burning fuses, which do not give the person lighting enough time to get away. "Parents need to exercise caution and make certain they're buying fireworks that comply with their state and local and county ordinances," Tenenbaum warned.